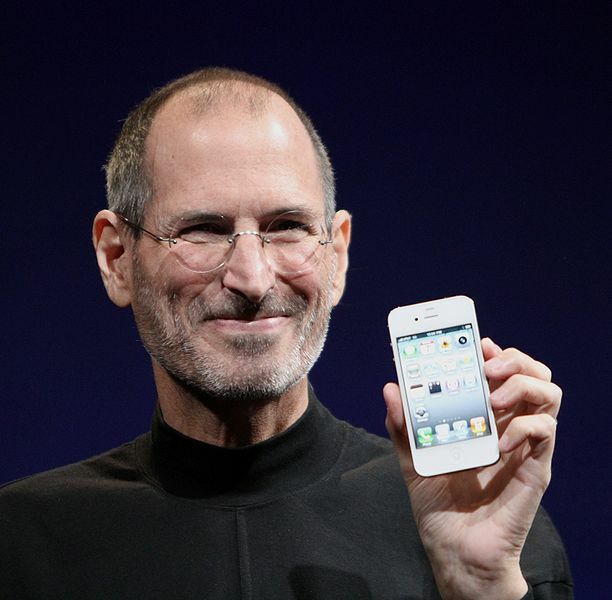 Steve Jobs, cofounder of Apple Computers who died this week, had a reputation as a passionate business leader and a modern folk hero. In 1999 one of Jobs’s friends said, “He is single-minded, almost manic, in his pursuit of excellence.” That’s certainly a character trait we scientists can admire. Steve Jobs, one of my marketing heroes. Let’s take a look at another one of Job’s traits that we scientists can benefit from emulating. Jobs was also revered in Silicon Valley for being a first-rate salesman. And every successful scientist knows that scientists need to sell themselves to get jobs and win grants, especially in these tough economic conditions. “Of course, scientists need to be salespeople,” Troy Rubin, neuroscience postdoc at Johns Hopkins told me. Part of what made Jobs so great at selling his ideas was his optimism and enthusiasm. Jobs peppered his presentations with words like “extraordinary,” “amazing,” and “incredible”. When Jobs gave the opening presentation at the computer expo Macworld ’08, he began his talk with open arms, a broad grin, and the words “We’ve got some great stuff for you. There’s clearly something in the air today.” That kind of enthusiasm helped Apple sell 20,000 iPods every day. 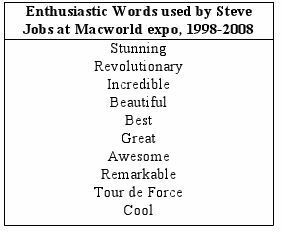 Table 1 lists some more words used by Jobs during his presentations at Macworld expo over the last several years. I collected them from YouTube. Maybe we can’t all match Job’s flair for presentations, but maybe these words are a good clue about the right attitude to have when it comes time to sell our science. Of course, enthusiasm is not something they teach in science class. Far from it. Graduate school is all about being tough and skeptical. But as you remember from kindergarten, everybody likes people who are positive and enthusiastic; a smile on your face addresses people’s primitive needs for friendship and belonging. So a good salesperson considers optimism to be part of his or her job. There’s more to it than that; to some degree, we can actually quantify just how important enthusiasm is. For some reason, negative expressions leave a more lasting impression on our psyche than positive ones. Specifically, negative messages have something like five to seven times as powerful an impact on our minds as positive messages. Studies show that when a married couple has more than five positive interactions for every negative one, marriage experts say the relationship is healthy. But if the couple starts having fewer than five positive interactions for every negative one, divorce is probably imminent. If you’ve ever sat on a review panel or hiring committee, you have probably noticed that if someone says something strongly negative about an applicant, it leaves a lingering stain that can’t be erased unless several people override it. For this reason it’s important to have at least five to seven members on any decision-making panel. With fewer people on the panel, a single person’s bad feelings can swamp the decision-making process, turning it into a black-balling session instead of a thoughtful discussion. 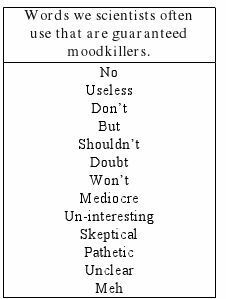 This disproportionately powerful effect of negativity in review panels is a consequence of human nature that we scientists often need to be aware of. For example, if you’re writing a proposal or applying for a faculty position, you might have to impress a committee with slightly fewer members than it ought to have. That means your task might be more about eliminating negatives than about dazzling people. Consider the negative words in Table 2. Even just looking at them gives me an unpleasant feeling. If you find yourself using them often, people might start associating that kind of unpleasant feeling with you. And it might take five to seven positive interactions to make that bad feeling go away. Thank you, Steve, for your splendid computers, used by scientists the world over. And thank you for teaching us about the craft of salesmanship, another crucial tool for scientists during these hard times. On behalf of nerds everywhere–we will miss you. (Originally posted at Scientific American Blogs).